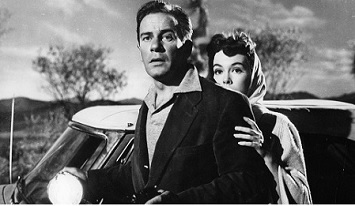 Meteor meets mine out in the Arizona desert in It Came from Outer Space. Except it’s not a meteor, as amateur astronomers are initially led to believe, but a titanium box structure with a hexagonal hatchway, not unlike the Cannon Films logo. There’s a trail of weird fairy dust leading up to the craft, and something pulsating within, all set to a Star Trek theremin score. Soon, a chopper is soaring over the crater, then landing nearby. It’s piloted by reluctant Pete, who’s accompanied by space-obsessed astronomers John and Ellen. When John descends into the dust, he spies what looks like a soccer ball, then barely escapes with his life after rocks begin to cave in around him. In one account, “It lit up the sky like the end of all creation!” so not surprisingly, law enforcement and media are quickly on the scene, trying to poke holes in rattled ol’ Johnny’s tale of seeing something sentient down in the sandy basin. The morning paper riffs STARGAZER SEES MARTIANS, as journalists are following up for more quotes from John. Soon, telecom engineer George (Russell Johnson, best known for his role as Professor on Gilligan’s Island) is behaving very strangely, wandering around out in the desert and leaving his vehicle with the doors wide open. Citizens are soon reporting that their significant others are acting abnormally. In this case, the film went through several changes, not the least of which was going from the prosaic The Meteor to Man from Outer Space to Strangers from Outer Space, and finally, the incredibly evocative and hilarious title we’ve all come to know and love. It Came from outer Space is not without its flaws: listless pacing and a few too many “I tell ya’s!”, common vernacular of the time, but it’s interesting in that it predated Invasion of the Body Snatchers by a few years and also made the otherworldly intruders benevolent instead of evil as in Invaders from Mars and most sci fi films of this ilk. This entry was posted in Science fiction and tagged 50s movies by Really Awful Movies. Bookmark the permalink.